Homemade creamed corn is so much better than the canned version. Pair it with Fire Roasted Cornbread for a spectacular side dish. To make the creamed corn, melt butter in a large skillet set over medium high heat. Add the minced garlic and sauté for 2-3 minutes. Add the frozen corn, sugar, salt, pepper, and heavy cream. Cook for 5-6 minutes or until cream is simmering. Once simmering, reduce heat to low. Remove half of the corn/cream mixture and blend until smooth in a blender or food processor. Return the puree to the pan; stir to combine. Remove from the heat. If not baking in the skillet, transfer creamed corn to a 9x13 inch pan. To make the cornbread, stir together water, melted butter, mayonnaise, and full box of Krusteaz Fire Roasted Cornbread mix until blended. Spoon mixture over creamed corn. 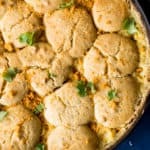 Bake casserole for 20-22 minutes or until cornbread is golden brown. Sprinkle with Elote topping (included with mix) after baking, if desired.